little momma and company: mouthfull of crumbs. I wanted them to go out with a bang! I wanted the last of the berries to be used in a way that was worthy of their perfect fruit wonder. Then, I scavenged the last of the coveted berries from a secret spot in the back of my freezer. The house smelled like tangy tart summer. We couldn't wait for a chance to taste a bit of warm sunshine and sugar. 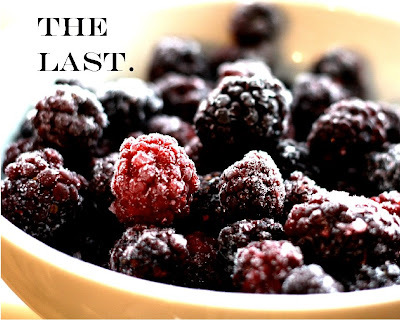 Goodbye berries. I can't wait until July so I can see you again! Grease a 9X9 pan. 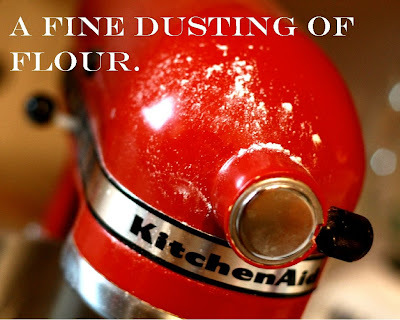 Combine flour, baking soda and salt. 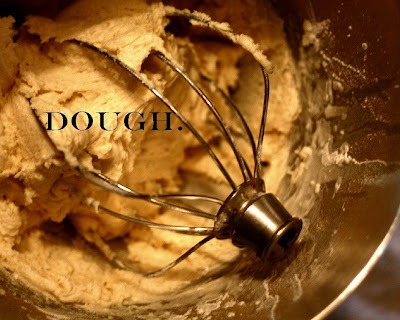 In a mixing bowl beat shortening, egg, and sugar. Add dry mixture and milk alternately to wet mixture. Beat until smooth. Spoon batter into prepared pan. 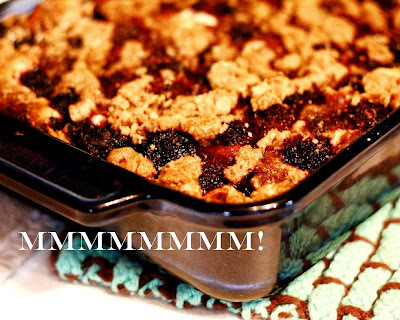 Combine the 1/2 C flour, 1/2 t cinnamon, and 1/4 C butter until the mixture resembles coarse crumbs. (I added a few tablespoons of brown sugar to the mixture too.) Top the berries with the mixture. Bake at 350 for 50 to 60 minutes. Looks absolutely delicious and wonderful. I love how you always post the recipes, too! Sounds divine! It was a summer desert kind of weekend huh? I made lemon bars and it smelled like summer, so this just made me smile. Oh, and I got a hankering for hanging out in the square the other day...sometimes I miss AZ. 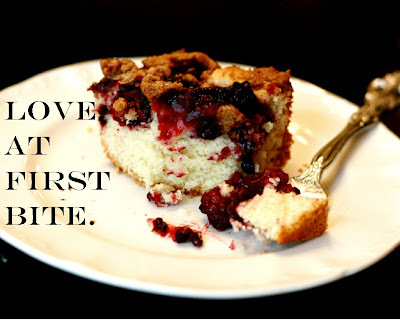 Have I mentioned I want to come to your house every Sunday for dessert? 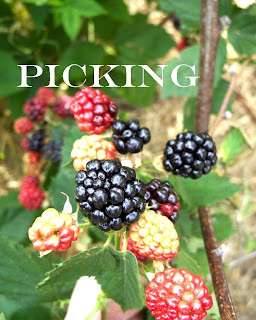 We have thornless blackberry bushes in our garden, and I love them! Thanks for the recipe. This makes me want it to hurry up and be spring already! This would be perfect to eat outside! That reminds me that I need to go check on my blackberry bushes... They should be getting leaves now and beginning to flower next month, or earlier if the weather keeps up. Mmmmmm. Definitely saving this recipe, it looks delicious!!! Oh my goodness! My mouth is watering! Looks so yummy! 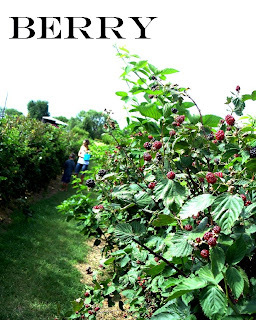 I miss the berry picking seasons of summer! Strawberry, black raspberry, cherry, blueberry and raspberry ...oh how I miss thee! 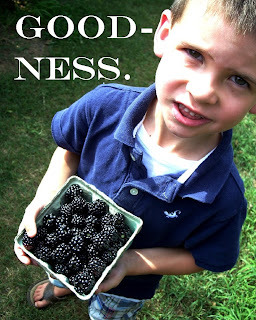 To my wonderful delight...I found one bag of frozen blackberries (from our pickin' adventure last Summer) last week!!! PERFECT amount for your Blackberry Buckle!! THANKS! Emily, you really should have your own cooking show.